Premier Rachel Notley at June 6 media conference. Kinder Morgan won’t defend its own pipeline in Vancouver. Industry associations keep calling for more pipelines but won’t support Trans Mountain Expansion on the ground in the lower mainland. Alberta media – known affectionately in our newsroom as the Lapdogs of Calgary – simply shout into the Alberta echo chamber about those naughty BC eco-warriors. Finally – finally! – the Rachel Notley and the Alberta government are wading into the fray, but with the entirely wrong message. Beginning this summer, the NDP leader says her government will tell “our story” – meaning the Alberta oil sands story and why they’re in the national interest and deserve a 525,000 b/d pipeline from Hardisty to Burnaby – to middle of the road British Columbians not yet railroaded into the “no” camp by the environmental groups, mayors, BC NDP and BC Green Party, and others who oppose the project. 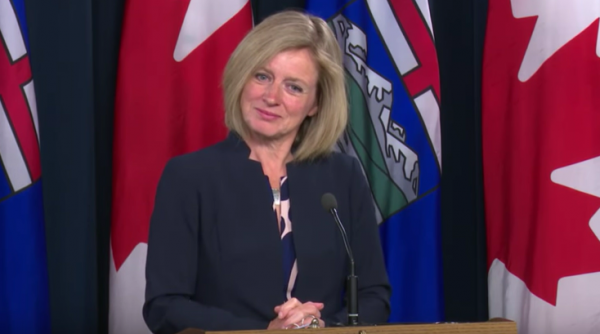 “You’ll see additional efforts on the part of the Government of Alberta over the next little while to generally tell our story in BC to a greater degree,” she told reporters at a session-ending media conference last week. Time will tell if Alberta has dithered too long and missed the opportunity to capture the hearts and minds of potential BC supporters. From one point of view, the government is years too late to reach out to British Columbians who are moderate on energy issues. Kinder Morgan’s bulldozers could fire up as early as Sept. What good can Notley possible accomplish in two or three months? If Christy Clark and the Liberals somehow hang on to government, she is now firmly entrenched on the pro-pipeline team. In fact, aside from a few business groups like Resource Works, she may be the only player on the pro-pipeline side. The other team’s bench is, frankly, overflowing. 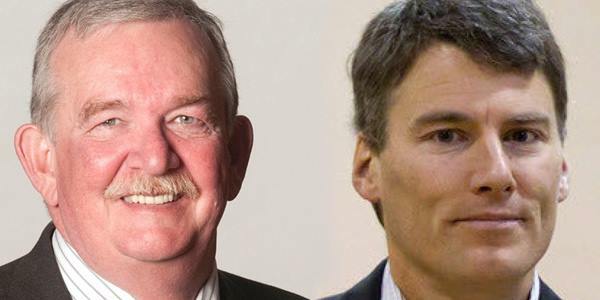 Vancouver Mayor Gregor Robertson and Burnaby Mayor Derrick Corrigan will stir up their cities again. The Tsleil-Waututh Nation is fighting Kinder Morgan in court. Local eco-activists are licking their chops, eager for a fight – one that is almost certainly going to include direction action and violence. Anti-oil and gas media like National Observer and The Tyee are almost apoplectic over the thought of evil “tar sands” crude oil being shipped to Asia from the West Coast. And you can bet celebrities like Jane Fonda will be thick as fleas on a Airedale when the TV news cameras start to roll. Derek Corrigan, Burnaby mayor (left), Gregor Robertson, Vancouver mayor. There is going to be a news media and social media onslaught this fall in Metro Vancouver. 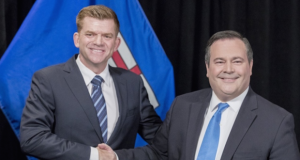 How does Notley intend to cope with so much antipathy? “I think what we really need to do is focus on the law. We believe the law is on our side. 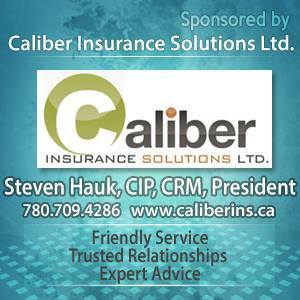 We believe the appropriate agency, with the appropriate authority – i.e. the federal cabinet – made the right decision and they made it based on the right considerations,” she said. Enforcing the rule of law because proper process followed is the Kinder Morgan line. It’s the Brian Jean and Jason Kenney line. Where is the talk about “taking the carbon out of the barrel” thanks to the oil sands emissions cap and output-based allocation regulations prodding producers to adopt new in situ and mining technologies that will reduce greenhouse gas emissions to those of average American crude oil? Or even lower, if producers are to be believed. Where is the talk about new partial-upgrader technology that could transform bitumen into medium or heavy crude oil that doesn’t require 30 per cent diluent to be shipped in pipelines (like Trans Mountain Expansion)? Where is the talk about a province-wide carbon tax and reducing fugitive methane emission by 45 per cent? Notley and the NDP spent the past two years – and a tremendous amount of political capital – enacting the most ambitious energy and climate policy in North America, which is exactly the right strategy to win the support of moderate Vancouverites. Why go to all that trouble and then fall back on the “the rule of law” argument that everyone with even a bit of insight into this issue knows will get no traction in the lower mainland? And the Notley message works! in person and on social media to say my argument in favour of the oil sands and pipelines was “far more persuasive,” as one bearded fellow in a bike helmet told me. Let’s hope someone in the Premier’s Office comes to their senses and realises what a God awful mistake the Alberta government is about to make. Notley would do better to just shut up and stay home than to argue in favour of the National Energy Board process in Vancouver. It truly beggars the imagination. Mark, you ought to know better, the existing kinder morgan pipeway is federal land, no matter what anyone does, it not provincal matter, its federal. And given that Trudeau is the final word on it, all of whats going on, being said, etc, doesnt mean a thing.